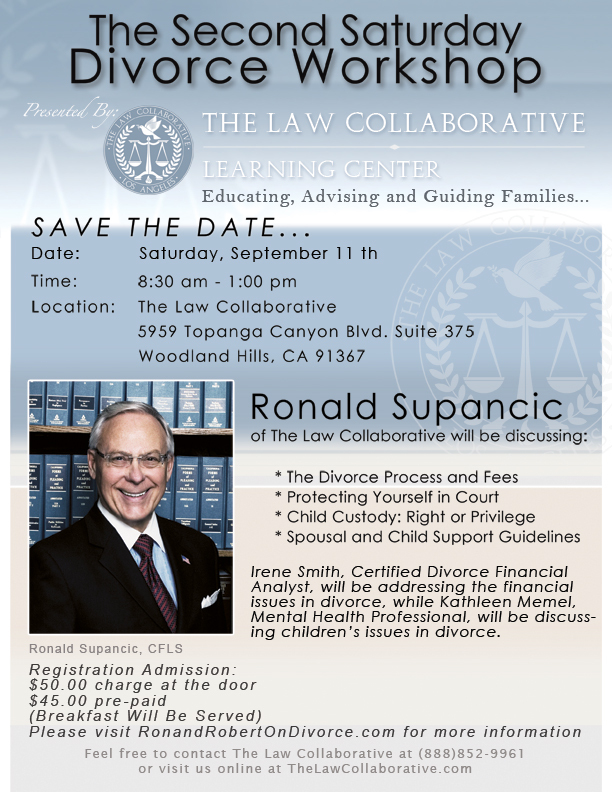 Please join us for our next Second Saturday Divorce Workshop on 09/11/2010. See below for additional info. Our latest podcast is now live on iTunes, please click HERE to listen to podcast #45 (Step By Step Guide To Divorce, part II). Listen to Step By Step Guide to Divorce, part 1 HERE. If you were filing for a divorce thirty years ago, you didn’t have a whole lot of options. Certain laws favored mom, certain laws favored dad. You had to prove there was reasonable cause for the divorce and if the judge thought your reason wasn’t good enough, you didn’t get your divorce. Things worked a certain way and there wasn’t much you could do about it. Today, we have lots of options. We can mediate or arbitrate, we can collaborate or litigate, we can rent a judge and get divorced at the four seasons or sit at our kitchen table and work it out over coffee and donuts. Unfortunately, most people have no idea there are so many options. Our legal system has been designed for battle, so we hire lawyers slick as knives and we cut each other until we are each bloodied and broken. But what is the point of that? How does that help? How do you heal from a wound cut so deep? The fact is this: Divorce does not have to leave you bloodied and broken. You can have a divorce where you emerge on the other side with your eyes opened wide to the possibilities of new life. Where you come out standing with your shoulders back and your chin up. It’s up to you. You get to choose which divorce you have; the one with all the blood and gore, or the one where you come out standing straight and strong. What’s in it for me? That is the question that a client usually asks when mediation is suggested. Ideally, mediation of a divorce case will save people; will save them angst, alienation, and money. Mediation requires that both lawyer and client clearly and specifically identify their ideal solution to the dispute, and both are advised to carefully consider the other party’s desired outcome as well. 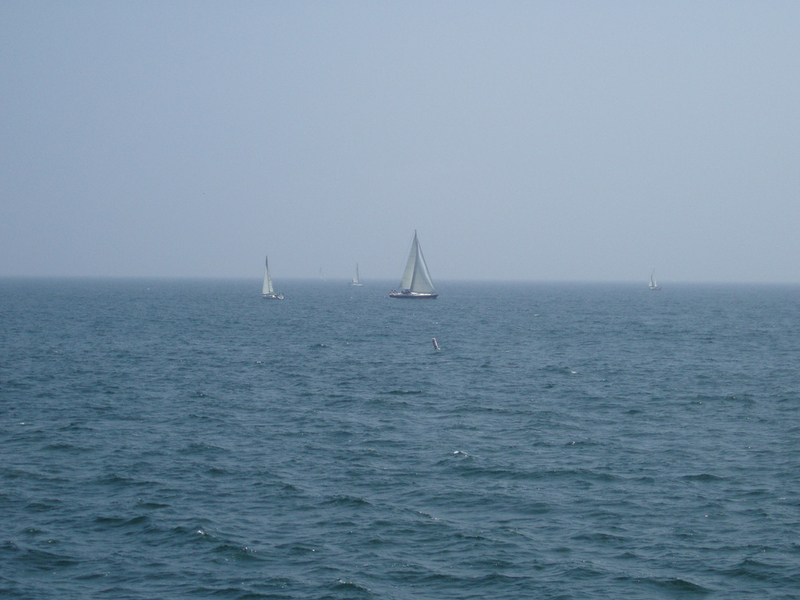 Mediation can be a Win-Win proposition if those involved really want it to work. From the outset, The Law Collaborative’s goal is to design a settlement agreement that will realistically fulfill the basic needs of all of the parties to the mediation. We happily and readily employ the word, “compromise.” To compromise, cooperate, concede – in other words, to find the middle ground and occupy it. This is the place from which people are able to negotiate their way through dispute to agreement. 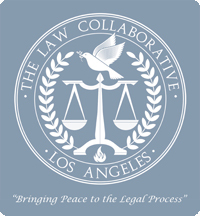 Many lawyers consider that they are competent to practice collaborative family law because they believe in settling cases and resolving disputes outside of court. However, a willingness to settle is not the only requirement. The attorney who wishes to employ collaborative law in his practice must have a thorough knowledge of negotiation skills, and understand the underlying theories and strategies of negotiation. Minimum standards for collaborative family law practice are continually expanding, as the work continues to attract more followers throughout the country. The Law Collaborative is pleased to provide education for attorneys and other collaborative professionals, making available new tools, technology, and information generated by professionals successfully engaged in the practice. To those professionals interested in learning more about collaborative practice, consider attendance at our 3 day workshop coming in November! We also invite you to our next Second Saturday Divorce Workshop, which will take place on August 14th at our Woodland Hills Office. 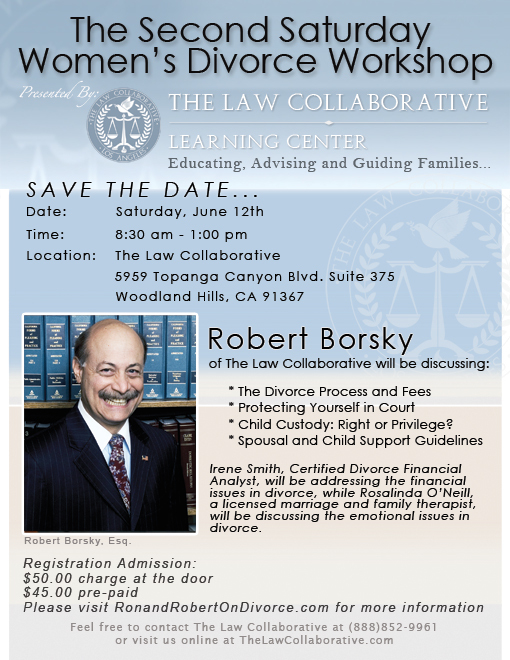 Attorney Robert Borsky of The Law Collaborative will address the legal issues in divorce. Irene Smith, Certified Divorce Financial Analyst, will discuss the financial issues associated with divorce. A marriage and family therapist will also address emotional issues in divorce situations. This workshop is beneficial to anyone contemplating divorce, or curious about their options. Pre-registration cost is $45, or $50 at the door. Breakfast will be served. Please call our office at (888) 852-9961 for registration and additional information. We are here to serve you. Visit Ron and Robert on Divorce on iTunes and subscribe to our free weekly podcast. Follow us on Twitter, be our friend on Facebook, and remember to “Like” our Facebook pages — we have two! The Ron and Robert on Divorce Community Page and The Law Collaborative Group Page. If you’d like to sign up to receive our monthly newsletter, click HERE. The most important lesson to be learned in life is that who you are being in the world is far more important than what you say. You may know all manner of wonderful things and be very proficient in the practice of your art, but if you demonstrate a substantial deficit in integrity, than all your words mean very little. 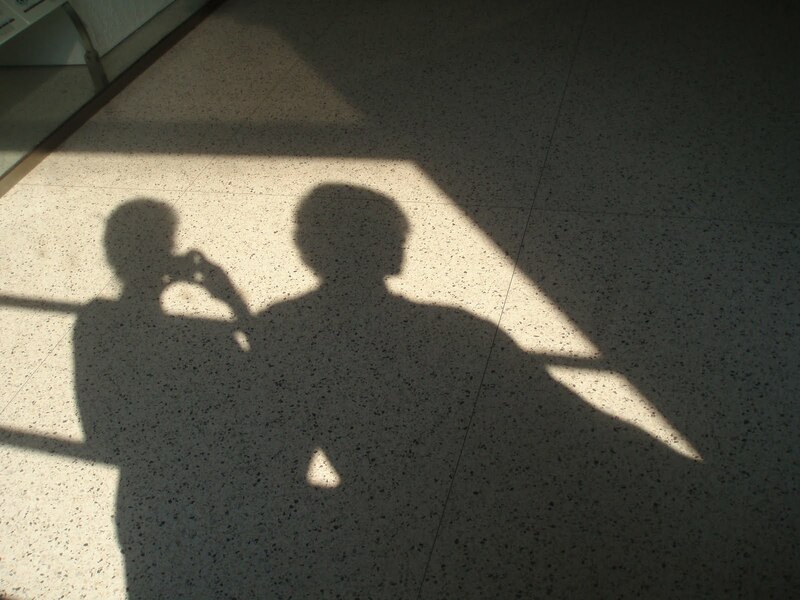 Don’t tell me who your are, show me who you are being. We all share a commitment, as helping professionals, to set an example to our peers that is based on measurable values. I want to know what you stand for before I care what you do. We live in the best of times and the worst of times. Values are being challanged daily. There are great opportunities to be better than we have been in the past, or worse. We make choices every moment of every day. Every choice we make has specific consequences. The question is whether we are making choices congruent with our values or not. It is really that simple. I only wish it were that easy. — Ron Supancic, as interviewed by Karyn Foley during a 2007 Calabasas Author’s Night. Calabasas Author’s Night – The Real Cost of Ending a Marriage from The Law Collaborative on Vimeo. Lin Morel was seventeen when she met the man who would become her husband. He was her childhood sweetheart, and they married when she was just twenty. But their marriage did not have the happy ending we hope for. What started as a fourteen year romance became a nightmare when Lin’s husband flew into a rage and strangled her in front of her daughter. The marriage ended, but the emotional violence did not, and their child became a pawn in an abusive relationship. Today Lin holds a Masters of Applied Psychology, she is a Holistic Healthcare Practitioner, a Doctor of Spiritual science and author of Get Clear, Get Connected, Get a Job. She is also a fifth degree black belt and president of AWBW.org, a non-profit that works to help end the cycle of domestic violence. Dr. Morel is living proof that when we follow our inner wisdom, life unfolds in an incredible way. Click the play button to hear Dr. Lin Morel give a great interview for Ron and Robert on Divorce. We’ve all heard the expression about “marriage for better or for worse,” but I don’t think most people have heard the expression “divorce for better or for worse”. The reality is relationships never end. Relationships are forever. Relationships only change over time and they either get better, or they get worse, depending on the choices we make. Click the play button below to hear more, and subscribe to us on iTunes! Mary Anne Loughlin and Patrick Greenlaw interview Ron Supancic for CNN’s DayWatch in 1991. The topic? Divorce and property settlement in California. There’s even a reference to the old classic film, War of the Roses. Check it out! The Law Collaborative – Ron on CNN from The Law Collaborative on Vimeo. This page took 0.445 seconds of computer labor to produce.